The Xbox One comes with Wi-Fi built right in, but it doesn't always work. There are a lot of circumstances that can prevent an Xbox One from connecting to Wi-Fi, including interference and obstructions, networking issues, and even corrupt or incompatible router or modem firmware. Distance and interference: Most Xbox One Wi-Fi problems are caused by the console being too far from the wireless router or too much interference on the same frequency that the router is using. These problems can be fixed by moving the console or router, removing the source of interference, or switching to a different type of connection. Networking equipment problems: A lot of Wi-Fi connectivity problems are caused by networking equipment like routers and modems. You can usually fix these problems by power cycling your networking equipment. Xbox One problems: Your console may have a hardware or software problem. If the wireless card has failed, there's not much you can do. If it's a software problem, then power cycling usually helps. Each of these basic categories encompasses multiple different root causes, with multiple different solutions. If you suspect a specific type of problem, then that's the best place to start your troubleshooting procedure. If you're unsure, then just start at the beginning and work your way through to the end. Wireless networks are convenient, but they're less reliable than wired networks. A connection that works fine one day may stop working the next, and the cause is usually related to new obstructions or sources of interference. If you've recently purchases, or moved, any electrical equipment that's capable of interfering with a wireless connection, that could be the reason your Xbox One won't connect to Wi-Fi. If you've moved your Xbox One, router, or placed any large objects between them, that could also be the problem. If your network doesn't even show up when you try to connect it to Wi-Fi, then this is where you need to start. Move your Xbox One or wireless router so that they are closer together. If you aren't able to move your Xbox One and router so that they're close together, try changing their positions to remove large obstructions. Solid objects like walls, ceilings, bookshelves, and other large pieces of furniture can all weaken a wireless signal. Exterior walls and bathroom walls are typically more difficult for wireless signals to penetrate. Try placing both the router and the Xbox One up as high as possible to reduce interference. Remove or unplug sources of interference like cordless phones, intercoms, and microwaves. Try switching your Wi-Fi network to a different channel. If you're using a 5 GHz Wi-Fi network, try switching to 2.4 GHz. While 5 GHz can provide faster speeds, 2.4 GHz networks have better range. If you aren't able to achieve a strong wireless signal in the area where you use your Xbox One, a Wi-Fi extender may help. 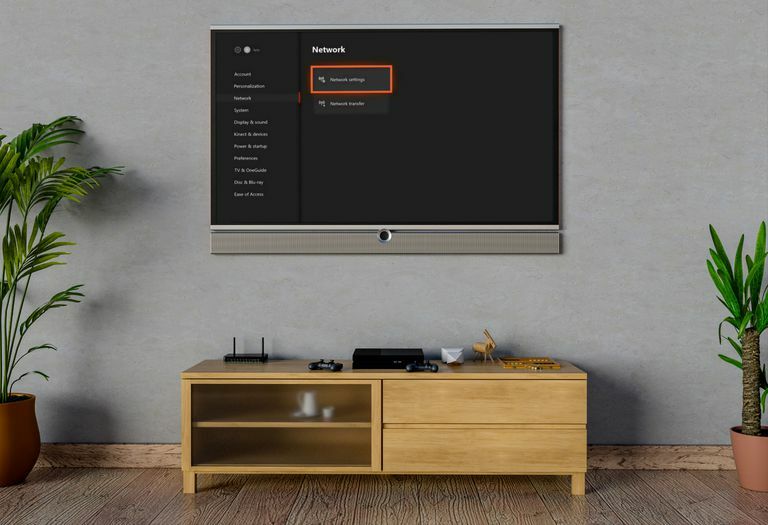 Issues with your network hardware and Xbox One can both cause problems with connecting to Wi-Fi, in which case power cycling one or the other will usually allow you to reconnect. If your Xbox One used to connect to Wi-Fi, and now it doesn't, this may be the fix you're looking for. Leave your modem and router unplugged for 10 - 30 seconds. Plug your modem and router back in. Shut your Xbox One down. Fully shut down your console by pressing and holding the power button on the front of the Xbox One for at least 10 seconds. Unplug your Xbox One from power. Leave your Xbox One unplugged for at least one minute. Turn your Xbox One on and check the Wi-Fi connection. When your Xbox One refuses to connect to your Wi-Fi network, one of the first things you should do is verify that you're trying to connect to the right network and that you're entering the correct password. You'll then need to check if your Xbox One can see your network, and make sure that you're attempting to connect to the right one. If you are attempting to connect to the right network, and you're entering the right password, but the process still fails, there may be an issue with your router firmware. This process will require you to log into your router to verify the name of your Wi-Fi network, which is known as a Service Set Identifier (SSID), and the password for your network. If you don't have access to your router, you will need to get help from your network administrator or the person who set up your wireless network. Open your router settings on a computer and check the SSID and password. You can usually access your router's settings by navigating to routerlogin.net, 192.168.0.1, 192.168.1.1, or 192.168.2.1. How to access your router as an admin. How to find and change your Wi-Fi password. Write down the SSID and password. Press the Guide button on your Xbox One controller, and navigate to System > Settings. Look for the SSID that you wrote down in step one, and select it. If you don't see the SSID of your network in this list, your Xbox One is probably too far away from your router. Use a different device to verify that your wireless network is working, and then try moving the Xbox One and router closer together. Enter the password you wrote down in step one. Check to see if your Xbox One has connected to your Wi-Fi network. What Else Can Prevent an Xbox One From Connecting to a Wireless Network? In cases where the Xbox One is able to see the wireless network you're attempting to connect to, and the correct password is used, but the console still won't connect to the network, there are a couple of potential issues that could be at fault. The most common issue is a firmware problem. Firmware is just software that's installed on a hardware device, like a wireless router or modem, that controls how it operates. If your internet service provider (ISP) updates your router or modem with new firmware, and there is some type of conflict that prevents your Xbox one from connecting to your network, there's not much you can do. You may be able to update your own firmware, if you own your hardware, but you will typically need to contact your ISP for assistance. Press the Guide button on your controller, and navigate to System > Settings > Network > Network settings. Restart your Xbox One, and check to see if you are able to connect to your wireless network. As convenient as Wi-Fi is, there are situations where it just won't work. Whether there's some type of new interference preventing your Xbox One from connecting, or a problem with your router firmware that your ISP refuses to fix, you may find that the only way to get your Xbox One online is to use a wired ethernet connection. The benefit of using an ethernet connection is that wired connections are much more reliable than wireless ones. If you play competitive games on Xbox Live, then even the strongest Wi-Fi connection can put you at a disadvantage due to latency. If there's absolutely no way for you to connect via ethernet, then you may want to try a set of network powerline adapters. With a powerline adapter, you can use the electrical wires in your house as a wired network, so you don't have to run a separate ethernet cable all the way from your router to your Xbox One.